As we kickoff year FOUR, we are grateful for the continued support of our members and community. We are doing important work and saving lives. This quarter we touched the lives of the less fortunate who are moving into homes and in need of furniture and household items; the blind and visually impaired in our community; and youth ages 15-21 who have experienced foster care and are transitioning into adulthood. Each of these organizations provide a valuable service to our community. Thanks to our members’ giving hearts, we donated $23,970 this quarter and people’s lives are being impacted on a daily basis. To date, our chapter has donated $253,050 to local charities. 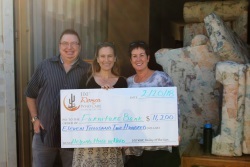 Ahwatukee donated $11,220 to Furniture Bank. This local charity is on a mission to assist the less fortunate who are moving into housing by providing furniture and household items. Many of these individuals, including children, do not have a bed or other necessities to take to their new home. It is their hope to create a positive and comfortable environment they can call home and put the stigma of being homeless in the past. Our donation will be used to buy beds for those they help and secure additional warehouse space for donated furniture. 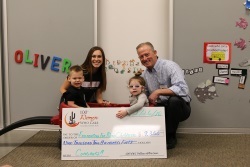 Foundation for Blind Children was the recipient of $9,350 in donations from our Scottsdale group. “You can teach them or you can serve them.” This is the philosophy embraced by FBC. This local nonprofit teaches over 2,000 blind and visually impaired individuals annually, ages birth to 103, how to succeed in life. Our donation will be used to support their therapy programs which include full-time nursing, occupational therapy, feeding therapy, physical therapy, speech/language therapy and medical interventions including tube feeding, tracheal maintenance and delivery of medication. 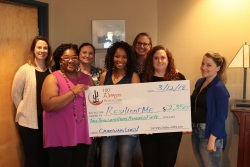 Our West Valley sister group donated $3,200 to ResilientMe. ResilientMe is a research grounded, trauma sensitive prevention program. Aging out of foster care can be one of the most traumatic events of a young adults’ life. ResilientMe is founded on the belief that in order to give our aging out population a chance at being successful adults; we must equip and prepare them to handle the challenges they will face as adults. Our donation will partially fund the facilitation cost of the program and supplies. Typically 15-20 foster youth participate in each program day when delivered. Our East Valley group was officially launched on February 8th! We have almost 50 members already committed to coming together quarterly to make a bigger impact than they could do alone. Meet our East Valley leaders, Leann Kendzlic Landberg, Trenna Reid Farrell and Susan Barlow. 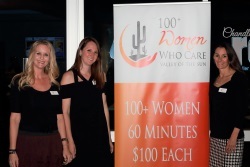 We are thrilled to have them join our team and expand our giving circle to the East Valley.